Istidraj are a band from Singapore that plays a very raw and brutal form of Satanic war/black metal and this is a review of their 2007 album "Blasphemous Ritual" which was released by Satan's Millennium Records. Drums are very fast with alot of brutal blast beats that are also very heavy and skull crushing, while the bass playing sounds very dark with a lot of fast riffing. Rhythm guitars are very fast, heavy and brutal war/black metal riffs that also utilize some melodies at times and there are little to no guitar solos or leads present on this recording. Vocals are all very high pitched black metal screams, while the lyrics cover Satanism, Luciferian, Black Magick and a little bit of Nietzsche philosophy, as for the production it is very heavy, brutal, dark and raw sounding. In my opinion Istidraj are a very good raw and brutal satanic/war/black metal band and if you are a fan of this style, you should check out this band. RECOMMENDED TRACKS INCLUDE "Bidarari Desekration" "The Burning Twilight" and "Morbid Blasphemic Cult". RECOMMENDED BUY. Black Funeral are a band from Texas that has been around since the 90's and plays a style that I would describe as being Apocalyptic Satanic/Occult/Ritualistic/Black Metal and this is a review of their 2007 album "Waves Of Weeping" which was released as a joint effort between Season Of Mist and Behemoth Productions. Drums range from slow, mid paced to fast drumming with some brutal blast beats and some industrial style programming and on one song there is some tribal style beats utilized to conjure a demon, while the bass playing has a very powerful, strong and dark tone which is very easy to hear on this recording, as for the synths when they are utilized they bring a very dark ritualistic avant garde edge to the music. Rhythm guitars range from slow, mid paced to fast black metal riffs that are very dark and evil with some weird distorted parts and there are little to no guitar solos or leads present on this recording. Vocals are mostly high pitched black metal screams mixed in with some spoken word ritualistic elements and Gregorian chants, while the lyrics cover Luciferian, Goetia, Demonology, Black Magick, Persian Deities and the darker side of the Caballa, as for the production it has a very dark and heavy sound to it. 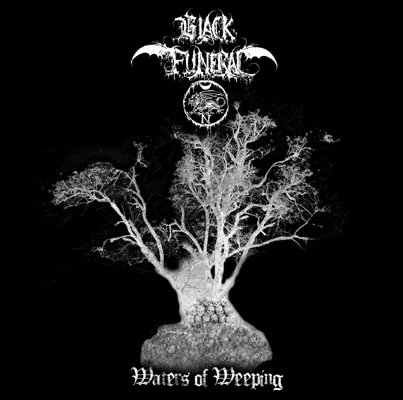 In my opinion this was a great album from Black Funeral and if you are a fan of this band, you probably already own this album. RECOMMENDED TRACKS INCLUDE "Nehemoth" "Lord Of The Dead" "Devourers Of Spirit" and "Loathsome Serpents". RECOMMENDED BUY. 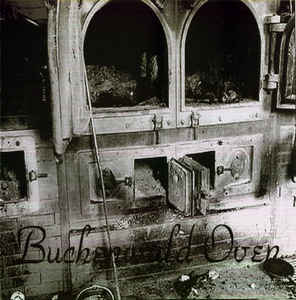 Buchenwald Oven are a band from Germany that plays a very raw and atmospheric form of ns black metal and this is a review of their classic self titled album which was released by Mass grave Records during the year of 2001. Drums range from slow, mid paced to fast drumming with some brutal blast beats being thrown in at times, while the synths are very dark and atmospheric sounding, as for the bass playing it has a dark tone that is kind of mixed down low in the mix and seems to follow the riffing that is coming out of the guitars. Rhythm guitars range from slow, mid paced to fast raw black metal riffs with some melodic riffing being used at times, while the lead guitars are very chaotic and melodic sounding black metal guitar solos. Vocals are all high pitched black metal screams mixed in with some Sieg Heil chants and deep growls", while the lyrics touch on National Socialism, Nazism, White Pride and Norse Paganism, as for the production it has a very dark and raw sound to it. In my opinion Buchenwald Oven where a great ns black metal band and if you are a fan of this style, you should check out this band. RECOMMENDED TRACKS INCLUDE "Hail Victory" and "Flame Of Hagalaz". RECOMMENDED BUY. This is a review of a split album of 2 goat metal bands Goatholocaust from Belgium and Vociferian from France and the album is called "Matre Bouc" and was released by Regimental Records, we will start of the review with Goatholcaust. 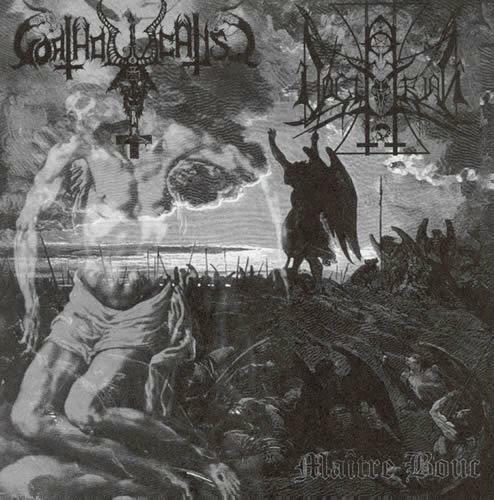 Goatholocaust play a style that mixes goat metal with war metal, black and death metal in a very satanic way. Drums range from slow, midpaced to fast drumming with alot of brutal blast beats, while the bass playing has a very dark tone that is mixed down low in the mix and seems to follow the riffing that is coming out of the guitars, as for the synths they are only used on one song and they have a very dark and evil avant garde sound to them. Rhythm guitars range from slow, midpaced to fast goat metal riffs that are also heavily influenced by war, black and death metal and there are little to no guitar solos or leads present on their side of the recording. Vocals are a mixture of high pitched black metal screams and deep goat metal growls and some spoken word female parts, while the lyrics touch on Satanism and Summerian themes, as for the production it is very dark, heavy and raw. In my opinion Goatholocaust are a very good goat/black metal band and if you are a fan of this style, you should check out this band. RECOMMENDED TRACKS "Black Flies Ov Hell" and "Baphomet Grand Kruxxification (Worship The Goat Ov Satan". Now we are going to review Vociferian from France which plays a style that I would describe as being brutal goat/war/black metal band. Drums range from slow, midpaced to fast drumming with alot of brutal blast beats being thrown in at times, while the bass playing has a very dark tone that is kind of mixed down low in the mix and seems to follow the riffing that is coming out of the guitars. Rhythm guitars range from slow, mid paced to fast goat/war/black metal riffs that are very raw and primal with some death metal influences ad there are little to no lead guitars or solos present on their side of the recording. Vocals are all deep goat metal growls while the lyrics cover Anti-judeo-christianity, Evil, Darkness and Death, as for the production it has a very heavy, dark, raw and evil sound to it. In my opinion Vociferian are a very good goat metal band and have the best music on this split, and if you are a fan of this style, you should check out this band. RECOMMENDED TRACKS "Mother Regression" and "Pride Ov The Unholy Path (The Ultimate Purikaion)". In my opinion this is a great split between 2 goat metal bands, and if you are a fan of this style, you should add this to your library. RECOMMENDED BUY. 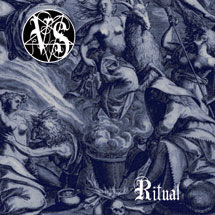 Velonnic Sin are a band from New York City that plays an occult form of raw black metal and this is a review of their 2005 album "Ritual" which was released by blackmetal.com. Drums range from slow, mid paced to fast with a great amount of brutal blast beats being thrown in at times, while the bass playing is kind of mixed down low in the mix and seems to follow the riffing that is coming out of the guitars and at times they sound very powerful, as for the synths they are only used briefly on one song and they have a very dark sound. Rhythm guitars range from slow, mid paced to fast raw black metal riffs that also utilize some thrash and death metal influences and melody with a brief use of slow and soft playing being used on one song, while the lead guitars have a death metal vibe to the guitar solos with some melodies, as for the classic guitars when they are utilized briefly they use finger picking and haunting melodies adding a darker dimension to the music. Vocals are mostly high pitched black metal scrams with some occasional spoken word passages, deep growls, Gregorian chants and there is a brief use of female vocals on one song, while the lyrics cover darkness, Greek Occultism, Magick and Anti Christian themes, as for the production it has a very dark, raw and heavy sound to it. 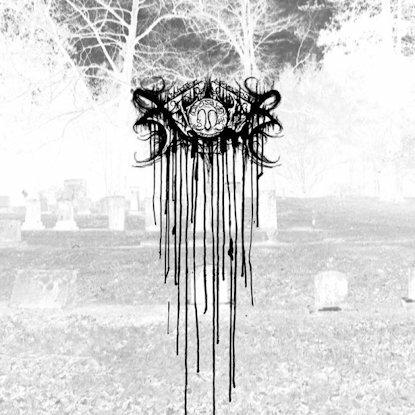 In my opinion Velonnic Sin re a very good raw occult black metal band with a melodic edge and if you are a fan of this style, you should check out this band. RECOMMENDED TRACKS INCLUDE "Ritual" "Over The Lethe" and "The Daemon". RECOMMENDED BUY. 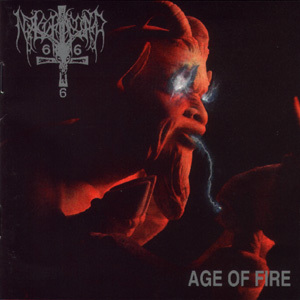 Nastrond are a band from Sweden that plays a very ritualistic/occult/atmospheric form of satanic black metal and this is a review of their classic 1996 album "Age Of Fire" which was released by Napalm Records. Drums range from slow, mid paced to fast drumming with a lot of brutal blast beats and tribal sounding drums being used on the more ritualistic parts of the music, while the keyboards are very atmospheric, ritualistic and dark sounding, as for the bass playing it has a very dark and powerful tone which is very easy to hear at times. Rhythm guitars range from slow, atmospheric to fast raw black metal riffs that also incorporate thrash and melodic elements, and there are little to no guitar solos or leads present on this recording. Vocals are mostly high pitched black metal screams mixed in with some spoken word ritualistic elements, while the lyrics cover Satanism, Demonology, Sumerian, Greek/Roman, Caballa, Luciferian, Rituals, Egyptian, Left Hand Path and Anti-Christian philosophies, as for the production it sounds very powerful, heavy and professional sounding for a black metal recording and you can hear all of the musical instruments that are present on this recording. In my opinion this was a classic album from Nastrond and if you are a fan of this band, you probably already own this album. RECOMMENDED TRACKS INCLUDE "Winged Phallus (Ferrocious Angel)" "Womb Of Chaos" and "The Red Force (Of The Trapezoid)". RECOMMENDED BUY. 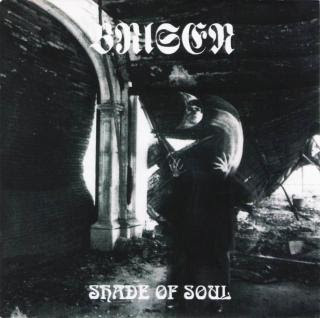 Brisen are a band from Italy that plays a very atmospheric form of satanic black metal and this is a review of their classic 1996 album "Shade Of Soul" which was released by Holocaust Records. Drums range from slow, mid paced to fast drumming with some fast playing and blast beats, while the keyboards are very dark and atmospheric sounding, as for the bass playing it has a very dark tone which is kind of mixed down low in the mix and seems to follow the riffing that is coming out of the guitars and at times they sound very powerful. Rhythm guitars are slow, mid paced to fast black metal riffs in the classic Italian tradition with a thrash feel at times, and there are little to no guitar solos or leads present on the recording, as for the acoustic guitars when they are utilized they use a lot of finger picking and full chords to add a darker dimension to the music. Vocals are all high pitched black metal screams, while the lyrics cover darkness, evil and anti-christian themes with one song written in Latin, as for the production it has a very dark and raw feel to it. In my opinion this was a great album from Brisen, and if you are a fan of 90's cult Italian black metal with an atmospheric edge, you should check out this band. RECOMMENDED TRACKS INCLUDE "Hills Of Thunder" "Tree Of Agony" and "Evil Power". RECOMMENDED BUY. 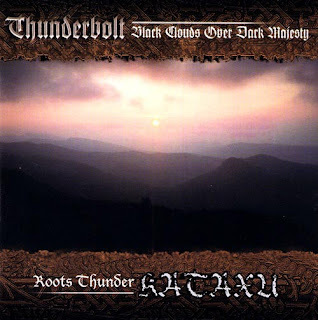 This is a review of a split album between 2 bands from Poland Thunderbolt and Kataxu which was released by Ancestral Research Records during the year of 2001 and we will start of the review with Thunderbolts part of the split "Black Clouds Over Dark Majesty". Thunderbolt play a style on this split not I would describe as being n.s satanic/pagan/black metal that is very raw. Drums range from slow, mid paced to fast with a lot of brutal blast beats being thrown in at times, while the keyboards are only used for background effects and don't over dominate the music, as for the bass playing it has a very dark tone which is kind of mixed down low in the mix and seems to follow the riffing that is coming out of the guitars. Rhythm guitars range from slow, mid paced to fast raw black metal riffs with some melodies being used at times and there are little to no guitar solos or leads present on this music, as for the classical guitars they utilized a lot finger picking to bring a pagan feel to the music. Vocals are all high pitched black metal screams with some occasional deep growls, while the lyrics cover Satanism, National Socialism and Slavic Paganism, as for the production it has a very dark, raw and heavy sound to it. In my opinion the music from Thunderbolt as really good on this split and if you are looking for some classic raw satanic/pagan/ns metal you should check out this band. RECOMMENDED TRACKS ""Shadows Of The Deepest Night" and "The Song Of Glory". 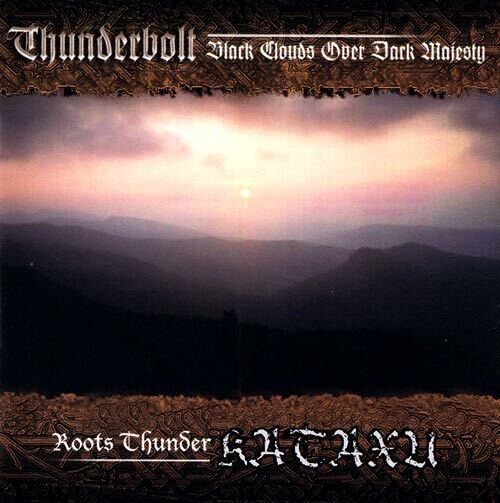 Now we will review Kataxu's half of the slot "Roots Thunder". Kataxu plays a style that I would describe as being atmospheric raw ns/pagan/black metal. Drums range from slow to mid paced drumming with some occasional fast playing and blast beats, while the keyboards are very dark/avant garde and atmospheric sounding with a lot of epic pagan elements, as for the bass playing it has a very powerful tone with times with some dark sounding slow to mid paced beats. Rhythm guitars are slow to mid paced raw/pagan/black metal riffs with some occasional faster riffing, and there are little to know lead guitar solos or leads present on this recording. Vocals are all high pitched black metal screams, while the lyrics cover Slavic Paganism and National Socialism, as for the production, it is very dark and raw sounding. In my opinion the music that Kataxu puts on this split is very good atmospheric ns/pagan/black metal and if you are a fan of this style, you should check out this band. RECOMMENDED TRACKS "My Name From The Forest" and "Roots Thunder". In my opinion this is a great split from Thunderbolt and Kataxu wth Thunderbolt having the best music on this split, I would recommended this classic for any ns black metal collection. RECOMMENDED BUY. 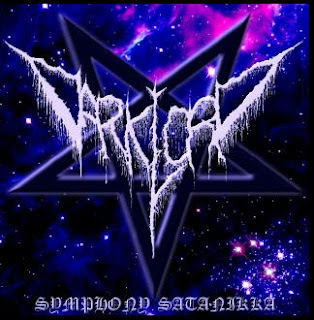 Darklord where a band from Australia that played a very atmospheric form of satanic black metal and this is a review of their 2001 album "Symphony Satanikka" which was released by Modern Invasion Records. Drums range from mid paced to fast drumming with a lot of brutal blast beats, while the keyboards are very dark and atmospheric, as for the bass playing it has a very dark tone which is kind of mixed down low in the mix with riffs that follow the riffing that is coming out of the guitars and at times they sound very powerful. Rhythm guitars range from mid paced to fast raw black metal riffs that are also very heavily influenced by death metal, while the lead guitars are very skilled chaotic and melodic guitar leads, as for the acoustic guitars when they are utilized briefly they use finger picking to bring a darker dimension to the music. Vocals are a mixture of high pitched black metal screams and deep death metal growls with some occasional horror film samples, while the lyrics touch on Satanism, Necromancy, Demonology and Anti-Christian themes, a s for the production it has a very dark, raw and heavy sound to it. In my opinion Darklord where a very good atmospheric satanic black metal band with a death metal edge, and if you are a fan of this style, you should check out this band. RECOMMENDED TRACKS INCLUDE "Infernal Necromancy" "Our Father Who Art In Hell" "Crush The Holy Priest" and "I Summon Thee". RECOMMENDED BUY. Krohm are a one man band from Seattle, Washington that plays a very depressive form of black metal and this is a review of their 2007 album "The Haunting Presence" which was released as a joint effort between Moribund Records and Debemur Morti Productions. Drums range from slow, mid paced to fast drumming with some occasional blast beats, while the synths bring a very dark and atmospheric sound to the music without being overdone, as for the bass playing it has a very dark tone with riffs that follow the riffs that are coming out of the guitars and at times they sound very powerful. Rhythm guitars range from slow to mid paced black metal riffs that are very depressive and melodic with some more fast raw black metal riffing being used at times and there are little to no guitar solos or leads present on this recording. Vocals are all high pitched black metal screams mixed in with some occasional spoken word passages and deep growls, while the lyrics cover Depression, Sadness, Misanthropy and Death, as for the production on this recording which was recorded at Cold Void Studio in Seattle, Washington through the months of June To December in 2006 has a very dark, clean and primal feel to it. In my opinion this was a great album from Khrom and if you are a fan of this band, you should already own this album. RECOMMENDED TRACKS INCLUDE "Lifeless Serenade" "Memories Of The Flesh" and "Syndrome". RECOMMENDED BUY. 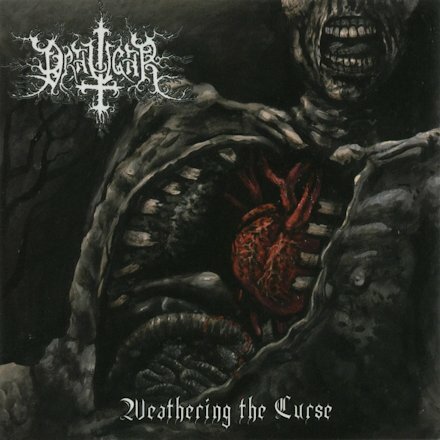 Draugar are a one man band from San Francisco that plays a very dark, weird and depressive form of black metal and this is a review of their 2004 album "Weathering The Curse" which was released by Moribund Records. Drums range from slow, mid paced to fast drumming with some blast beats being utilized at times, while the synths have a very weird avant garde experimental/dark ambient feel to them, s for the bass playing which i kind of mixed down low in the mix has a very dark tone with riffs that follow the riffing that is coming out of the guitars. Rhythm guitars range from slow, mid paced to fast black metal riffs that are very dark with some occasional soft playing being utilized at times, raw and avant garde sounding and there are little to no lead guitars or solos present on this recording. Vocals are very high pitched black metal screams that also have a very distorted sound to them, while the lyrics cover Darkness, Solitude, Hatred, Absurdity of Existence, as for the production it has a very dark and raw sound to it. In my opinion this was a great album from Draugar and if you are a fan of this band, you probably already own this album. RECOMMENDED TRACKS INCLUDE "I Come As A Curse" "Trails Of Blood That Lead To Dark Corners" and "Through The Dark Until You Die". RECOMMENDED BUY. 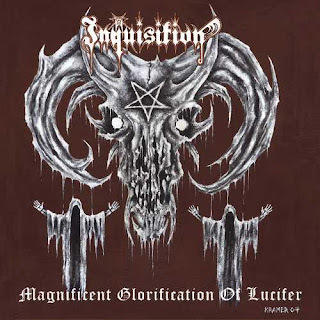 Inquisition are a band originally from Columbia but now reside in Washington state that plays a very raw and ritualistic form of satanic black metal and this is a review of their 2004 album "Magnificent Glorification Of Lucifer" which was released by No Colours Records. Drums range from slow, mid paced to fast with a lot of brutal blast beats, and there is not a single bass guitar present on this recording,,as for the synths which are used on the outro they bring a very dark avant garde edge to the music with some harsh noise effects. Rhythm guitars range from slow, mid paced to fast raw black metal riffs that conjure up the devil, while the lead guitars when they are utilized they are very distorted sounding with somewhat of a classic metal edge. 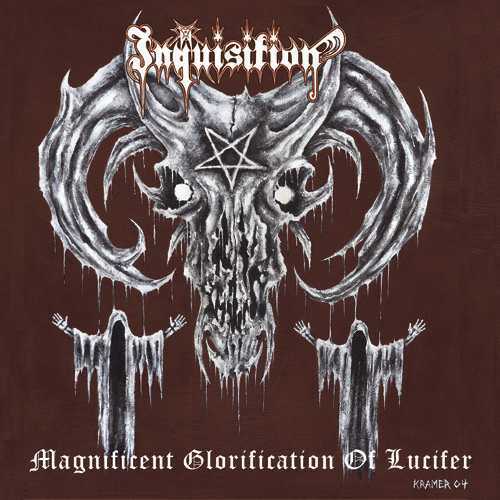 Vocals are mostly grim black metal screams or growls that are not very loud which was very original for 2004, while the lyrics cover Satanism, Luciferian, Dark Paganism, rituals and anti-Christian themes, as for the production on this recording which was recorded at Sonorous Studios between the months of June and July in the year of 2004 sounds very dark and raw. Aeba are a band from Germany that plays a very atmospheric form of raw/satanic black metal and this is a review of their underrated 2001 album "Rebellion" which was released by Last Episode. Drums range from mid paced to fast playing with a great amount of brutal blast beats, while the keyboards have a very epic and atmospheric sound to them, as for the bass playing it sounds very strong and powerful with riffs that are very easy to hear at times. Rhythm guitars range from mid paced to fast black metal riffs, while the lead guitars are very chaotic sounding black metal guitar solos with a small dose of melody, as for the acoustic guitars when they are used briefly they use a lot of finger picking to add another dark dimension to the music. Vocals are mostly high pitched black metal screams mixed in with some deeper grim sounding growls and some occasional clean singing, while the lyrics cover Satanism, Occultism and Darkness, as for the production on this recording it has a very dark and raw sound to it. 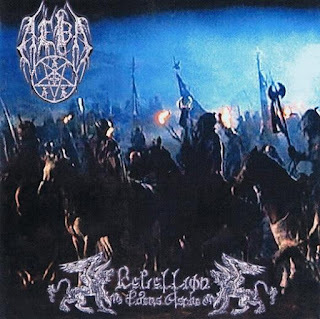 In my opinion Aeba are a very underrated band and this album was a classic and if you are a fan of raw/atmospheric/satanic black metal, you should check this band out. RECOMMENDED TRACKS INCLUDE "Sacred Demon Angle" "Darkness-Embrace My Self" and "Spiritual Evolution". DEMIMONDE BUY. Xasthur are a 1 man band from California that plays a very depressive form of ambient black metal and this is a review of their 2007 album "Defective Epitaph" which was released by HydraHead Records. Drums range from slow to mid paced beats that do get fast at times, while the synths sound very dark and depressive with an ambient and funeral doom feel, as for the bass playing it has a very dark tone with riffs that follow the riffing that is coming out of the guitars. Rhythm guitars range from slow to mid paced depressive black metal riffs that also utilize a lot of influences from dark ambient and funeral doom metal with some occasional fast riffing mixed in with some brief use of full chords on one song and there are little to no guitar solos or leads present on this recording. Vocals are all high pitched black depressive black metal screams with some occasional Gregorian chants and spoken word passages, while the lyrics cover depressive themes as well as astral projection with a very dark and occultic feel, as for the production it has a very dark and raw feel to it which makes the music sound very depressive and evil. In my opinion this was a great album from Xasthur, and if you are a fan of this band, you probably already own this album. RECOMMENDED TRACKS INCLUDE "Soulless Energy" "Dehumanizing Procession" "Worship (the War) Against yourself" and "The Only Blood That Purs Is Yours". RECOMMENDED BUY. 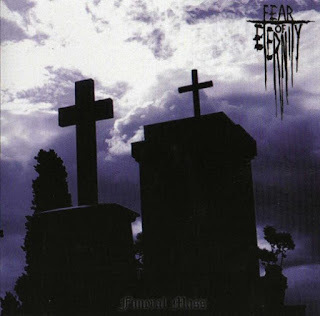 Fear Of Eternity where a band from Italy that played a very atmospheric form of ambient black metal and this is a review of their 2007 album "Funeral Mass" which was released by Moribund Records. Drum programming is all slow beats with no fast parts, why they synths are very dark, atmospheric, depressive and ambient sounding, as for the bass playing it has a very dark tone with riffs that follow the riffing of the guitars and on one song the sound very powerful. Rhythm guitars are very slow sounding ambient black metal riffs that are depressive at times and there are no lead guitars or solos present on this recording. Vocals are very grim sounding black metal screams, while the lyrics cover depressing and occult style topics, as for the production it has a very dark and raw feel to it. In my opinion Fear Of Eternity where a very good atmospheric ambient/black metal band, and if you are a fan of this style, you should check out this band. RECOMMENDED TRACKS INCLUDE "Evil Premonition" "Crying Cold Tears" "Inseparable Body" and "Eternally In Silence". RECOMMENDED BUY. 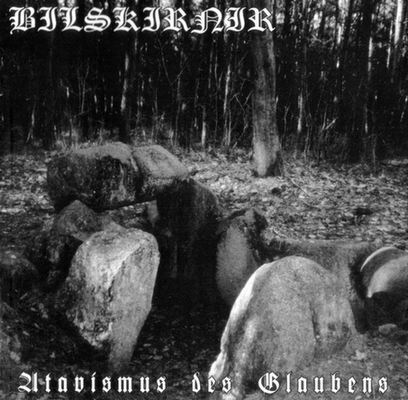 Bilskirnir are a one man project from Germany that plays a raw and primal form of pagan/viking/black metal and this is a review of their 2003 album "Atavisms des Glaubens" which was released by Nykta. Drums are mostly slow to mid paced beats with some occasional fast playing or blast beats, while the bass playing has a very dark tone with some slow riffs that follow the riffing that is coming out of the guitars. Rhythm guitars are slow to mid paced and primal viking/black metal riffs that call up the Northern gods with some occasional fast riffing, while the lead guitars when they are utilized which is rare are very primal sounding viking metal leads. Vocals are all high pitched black metal screams, while the lyrics are written in a mixture of German and English and cover Norse and Asataru themes, as for the production it sounds very dark and raw. 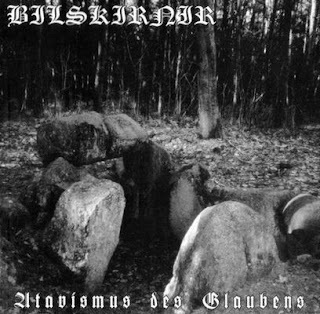 In my opinion Bilskirnir are a very good primal viking/black metal band, and if you are a fan of this style, you should check out this band. RECOMMENDED TRACKS INCLUDE "Atavismus des Glaubens" "By Fire, Midgard Shall Be Cleansed" and "The Cosmic Source". RECOMMENDED BUY. Things are going quite well at the moment and we're very excited how the new CD will be received by our fans. We're doing many interviews and are also playing a few shows to promote the album. There's many things to do, but in a positive way. does it differ from previous releases? The whole album is a bit tougher and harder from a musical and a lyrical view. At the same time the keyboard has become more opulent which makes everything sound more atmospheric and melancholic. The sound quality is even better as on the last album and is really powerful. The whole album is a bit rawer. 3.What are some of the lyrical subjects and topics the new release explores? The lyrics are cleary more critical than on the previous album, it's quite outspoken. We're explicitly criticizing society, church and political extremes. Sometimes it even sounds a bit too harsh, but we really want to make the listeners think about what we are trying to say, and how we see things. The name is Latin and just means "Legion of Death". Like probably every other band out there, we thought about which name we should have, and Legio Mortis was the one we thought to be the least stupid back then. There is no special meaning or relation to it. That's not so easy to tell. Each show we play has its own appeal. Of course there are shows after which you are not so happy with yourself, or after which you are upset because there were some mistakes or something. But that's live. In the end it is only important that the audience likes it. Among the shows which we would call special are for example our CD release parties in 2009 and 2011, or our 10 years anniversary show. Of course it is also great to play big festival shows. We always give our best when we play live, and we think that the fans usually notice and enjoy that. 6.Do you have any touring plans for the new releases? Up to know we have only had positive feedback from listeners. But as the album will not be officially released before 15th April we hope to get even more good feedback then. 8.What direction do you see the music heading into on future releases? Actually we're not planning on actively changing the music we make. We will always have fast, hard songs just as those melancholic, melodic ones. We never can say how a song will sound like before it's actually finished. That's how we always keep surprising ourselves. We're playing whatever we're in the mood to play, so it's really not predictable what will follow. music, and also what are you listening to nowadays? Everyone in the band has a different taste in music. This can range from Funeral Doom, over Power, Thrash, and Death Metal up to Grindcore, but also Classic Rock, Punk or Ska. The taste in music is very versatile, so there are also many influences and inspirations. If you look at the lyrics of the new album you can see that the "occult" and "satanic" subjects are getting fewer and fewer. Nowadays we mainly deal with more earthly topics, things you have to deal with every day. Of course the occult has always fascinated humans, but for us it is not so important anymore to write many songs about it. If you mean with satanism the idea of the freedom of the individual and the non-acceptance of religious dogma, then one might call us "satanist". Others might just call it sanity and reason. 11.Outside of music, what are some of your interests? Some of the band members play Warhammer 40k, a table top game, others like literature, movies, travelling, computer games....pretty normal stuff. But of course music, be it making music yourself, listening to it, going to concerts etc.eats up most of our time. Thank you for this interview and we hope you enjoy reading it. We also would like to benefit from this opportunity to thank everyone who has supported us and our music through the last years. Check out "The Human Creation and the Devil's Contribution" or come to one of our shows. 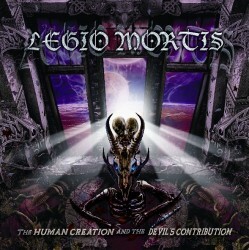 Legio Mortis are a band from Germany that plays a very atmospheric form of dark/black metal and this is a review of their 2011 album "The Human Creation And The Devil's Contribution" which was released by Massacre Records. Drums range from slow, mid paced to fast drumming with a great amount of blast beats being thrown in at times, while the synths have a very dark and atmospheric sound to them, as for the bass playing it has a very dark tone with riffs that follow the riffing that is coming out of the guitars. Rhythm guitars range from slow, mid paced to fast black metal riffs that are also very heavily influenced by death, doom and thrash metal with a great amount of melodic riffing being thrown in at times, while the lead guitars are very melodic sounding heavy metal guitar solos. Vocals are a mixture of deep death metal growls and high pitched black metal screams with some occasional clean singing female vocals, while the lyrics cover Satanism, depressing themes and murder, as for the production it has a very dark, professional and heavy sound to it. In my opinion Legio Mortis are a very good dark/black metal band and if you are a fan of this styles, you should check out this band. RECOMMENDED TRACKS INCLUDE "Unholy Four" "Pity The Sadness" which is a Paradise Lost cover "Blood Fantasy" and "Thorn In My Eye". RECOMMENDED BUY.